The Lowchen, also known as the lion dog, is a toy-sized companion dog. Although their lineage is up for debate, many believe these dogs originated in Northern Europe, and may even share close ties to the Toy Poodle. Back in the day, the Lowchen served one purpose, and one purpose only- they were designed to be a man’s best friend. Whether they lived on a farm or with royalty, the Lowchen was a favorite breed for anyone and everyone. Just like with most breeds, the Lowchen was on the brink of extinction during both world wars. However once the turmoil had ended, a few dedicated breeders were able to bring back the Lowchen breed. The Lowchen is both lively and affectionate- exactly what you want in a companion dog. Although small, this breed can be a great watchdog and will bark at the first sign of an intruder. However, they are never violent, and will eventually warm up to a visitor after a quick introduction. At the end of the day, all the Lowchen wants is to be with their family and the ones they love. You can expect this dog to jump on the couch or bed whenever it’s time for a cuddle session. Their even-temperament also makes them an excellent pet for a household with children. Because of their high intelligence, the Lowchen has an easy training process. With a little patience and consistency, a Lowchen pup will pick up simple tricks and commands in a snap. Just like with all other breeds, it’s important to socialize your pup from a young age. While he is a puppy, introduce him to different sights, sounds, people, and experiences. This will help him become a well-mannered and behaved dog later on in life. While the Lowchen loves to go outside for a quick play session, they are not a very active breed. A daily walk will be more than plenty for these pups, however, make sure you are still providing them with all the love and attention they desire. If they are not given an adequate amount of attention, they may develop depression or separation anxiety. As long as they have an activity to do with their owners, they will be the happiest and most devoted pet around. On average, the Lowchen lives to be about 12 to 14 years old. The Lowchen is still relatively unpopular within the United States. As of today, they are ranked as the 171st most popular dog in America out of 202 breeds according to the AKC. The Lowchen only requires about ½ to 1 cup of food per day, split into two equal meals. Keep in mind this may fluctuate depending on the dog’s age, size, metabolism, and activity level. For a more specific feeding regimen, consult with your veterinarian. 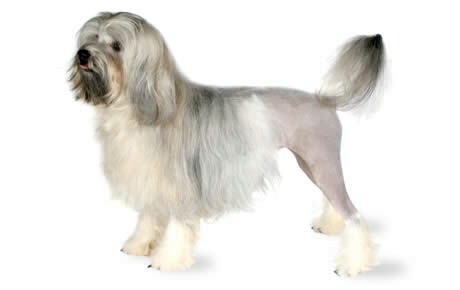 Depending on how you want your Lowchen to look, he can either be clipped (giving a lion appearance) or kept natural. Regardless of the grooming style you choose, make sure to brush your pup each week to keep his coat clean and tangle free. It is also important to brush your dog’s teeth every week to get rid of any bacteria or tartar that might be building up. Lastly, be sure to trim his nails every couple of weeks to avoid cracking or breakage. Are Lowchens Good with Kids? Since the Lowchen is gentle and playful, they serve as excellent playmates for children. However, keep in mind a child should be old enough to understand how to treat and interact with an animal. Once these ground rules are set, both the child and Lowchen can live under the same roof without any issues occurring. Cataracts: Cataracts in dogs occur when the lens of the eye turns foggy, which restricts light from coming in. This causes a loss of vision and can eventually lead to blindness. If blindness occurs, most veterinarians will recommend a corrective surgery to replace the damaged lens. Patellar Luxation: This condition occurs when the kneecap becomes dislocated. Patellar Luxation in dogs can cause lameness, immobility, and inflammation. Progressive Retinal Atrophy: Progressive Retinal Atrophy in dogs is a degenerative eye condition that causes blindness.